Award Style #3 Art Title Plate: Silver/Black Lg. 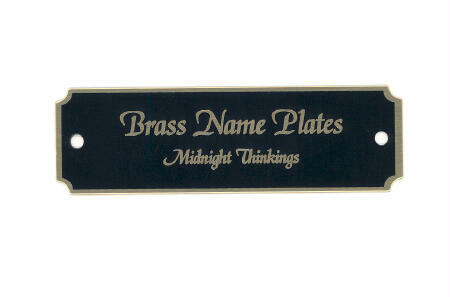 Metal nameplate with stylish border sets off the title and byline of any work of art without competing against the art itself. Laser engraved border and text in bright silver on smooth, black laquered finish. Large contemporary lettering denotes art Title line (up to 22 characters). Up to 2 addtl. lines of text (up to 45 characters each) set in a complimenting Sans-Serif font. - Self-adhesive (peel-n-stick) without pre-punched holes. 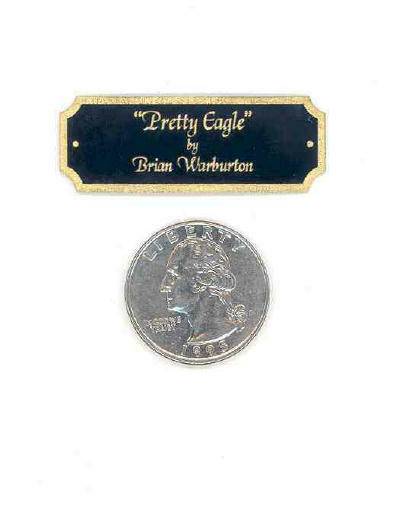 Art title plate is sized at 3-7/8" wide x 1" high - fits well on artwork up to 18" x 24". This product was added to our catalog on Thursday 15 January, 2009. Award Style #2 Art Title Plate: Gold/Black Sm. Award Style #4 Art Title Plate: Gold/Black Lg. Notify me of updates to Award Style #3 Art Title Plate: Silver/Black Lg.